Thame Mixed U12 - Wallingford Plate Cup - Champions! 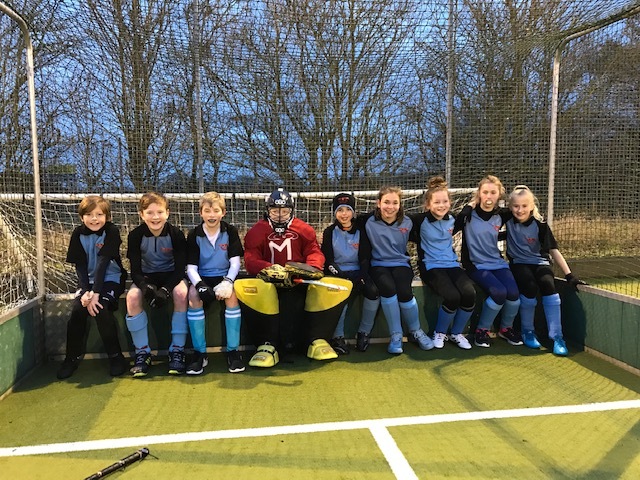 Thame Mixed U12 went to Wallingford (world's coldest pitch) this afternoon to play in the U12 plate contest and it went like this. We played Wallingford A first and in typical Thame style started slowly, but we won 1-0 thanks to some amazing defending from Ned and Eleanor and a PC goal from Charlie. We then saw off Oxford 2-0 with Barney taking both goals and the team working well with great runs from Romy and Ava. After a 45' break and a chat we moved things around for the next game and got Romy a new stick. We played Oxford Hawks and won 4-0 with much better positioning and passing from the whole team. Lucas was solid in defense along with Sophie who passed the ball to the midfield so well. Goals this time were from Barney, Hugo (excellent individual finish) and Romy with two clinical goals. We then played out final group game against Wallingford C - This was a tough game and whilst we defended well (Ned, Eleanor and Sophie on hand) we struggled to find the goal this time until the final minute after several attacks, Romy found the net to preserve our 100% record. So the full 12 points from 12, no goals conceded and into the Semi finals as group A winners. Semi final saw us battle with Wallingford B who were "good" and so we played the full 12' and then 3' extra time and fought well to keep it 0-0 - No team wanted to concede. All players did so well and ran and ran. So the the shoot out - Flicks - Only one of the team had taken them before so it was a little bit of a coaching 101 session in 3' we had from Gaynor and Matt to show them what to do and plan our step the final. Kids were so brave - As most of you know its hard to walk up there and in front of a home crowd and then compose, and take the flick. So we scored 3 from 4 and all takers were so amazing showing strength of character - Also for Ned, who is the other part of the equation, who saved 3 of the 4 shots sent his way - He did so well which meant, as a team, we made the final which is a big improvement on last year. So the final. We faced Witney who had put 7 goals past Hawks, 5 goals past Wallingford and looked a lot taller, meaner and older than our team. I'm not sure what happened but we played so well, our passing game flowed, the Witney team looked tired (their semi went to flicks as well) an we spent a deal of time probing their goal. So 0-0 into the last 3' minutes and the team pushed forward and with a swinging moved, Charlie slammed the ball past a defiant keeper. 1-0. Then we got thru a 1' scare with Witney attacking only to have the team pass the ball thru up to Romy who pushed it past the on-coming 'keeper: 2-0. We then saw out the final moments of the game in a relaxed manner. Great work! Ned, Eleanor, Lucas, Sophie, Barney, Ava, Hugo, Romy and Charlie's efforts meant Thame are now U12 Wallingford Plate Champions 2019. Amazing stuff and we're so proud of them.